Welcome To Mobile Vet To Pet! We have helped reduce stress levels for both pets and their owners by providing high quality veterinary care in the comfort and convenience of their own homes. Our practice is limited to small companion animals. This allows us to focus on offering the most current treatments and preventative healthcare available. At Mobile Vet to Pet we understand that your pets are part of your family, and we are committed to providing the best home healthcare possible. We work in concert with local animal hospitals, as well as specialty clinics, to fill any needs that cannot be addressed in the home. This ensures that your pet will receive the full spectrum of care. Services such as X-rays, surgery, hospitalization, and anesthetic procedures when needed, can be performed at the animal hospital of your choice. We are happy to work together to facilitate a smooth transfer of care, on the occasion when this is required in best interest of your pet. Please contact us today to learn more about our services, and experienced staff led by Dr. Joell Sheahan. We are dedicated to keeping your furry family happy and healthy. 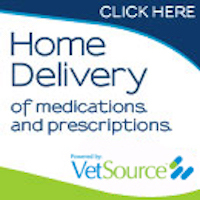 Through working at traditional veterinary hospitals, time and time again, a need for home care became obvious. Whether for pet anxiety issues or owner convenience – or both – visiting an animal clinic filled with unknown animals and people is just not in the best health interest of some pets. 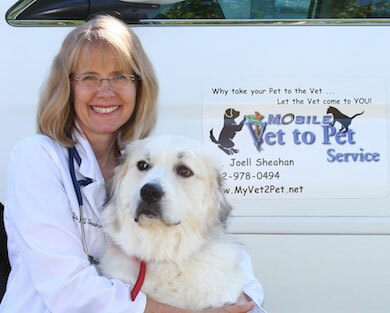 Mobile Vet to Pet was started to address this growing need. Dr. Sheahan is FearFreeTM Certified. FearFreeTM is a new initiative sweeping veterinary medicine designed to ease the stress, fear, and anxiety so many pets experience. Mobile Vet to Pet is committed to providing the very best care for your pet, with less stress, at a time convenient for you.